Composites scientist and engineer Vlastimil Kunc with the latest large-scale 3Dprinter at the MDF. March 21, 2018 – Vlastimil Kunc grew up in a family of scientists where his natural curiosity was encouraged—an experience that continues to drive his research today in polymer composite additive manufacturing at Oak Ridge National Laboratory. 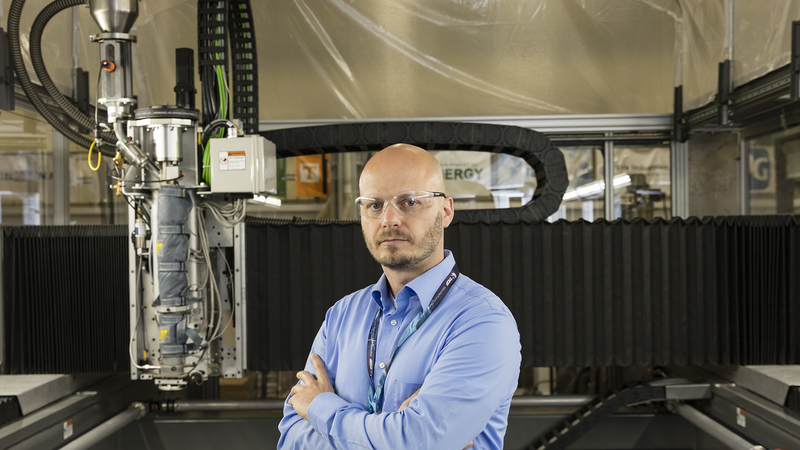 Kunc is the polymer team lead at DOE’s Manufacturing Demonstration Facility (MDF) at ORNL. He and his colleagues meticulously research the best combination of materials for 3D-printing various objects, leveraging materials science, modeling, and simulations. The work of Vlasta and his team was recognized in three 2017 R&D 100 Awards, for co-developing polymer carbon fiber compounds uniquely designed for the 3D-printing of molds for composite parts; coating solutions for large-scale 3D-printed objects such as manufacturing prototypes and molds; and for a feedstock blend used to 3D-print permanent magnets with similar or better mechanical, magnetic, and microstructural properties than traditional magnets. Along the way his team has successfully printed the first 100% additively manufactured tools to withstand industrial autoclaves. The tools—used as molds to create end-products by manufacturers—were printed using high-temperature thermoplastics and are currently being evaluated by industry partners such as Boeing and NAVAIR. “Additively manufacturing these tools will increase energy savings and decrease time, labor, cost, and error associated with traditional manufacturing techniques,” Kunc said. He and his colleagues work closely with materials suppliers, screening polymer chemistries and going through dozens of modifications before finding the proper recipe for additive manufacturing, he explained. “Having an in-depth understanding of the material microstructure, composition, and changes in the microstructure and composition during the printing process is critical,” he noted. Kunc began his college career studying mechanical engineering at the Czech Technical University in Prague. He first came to the United States in 1998 as part of an exchange program to learn English and ended up staying to earn his bachelor’s degree in mechanical engineering at Kansas State University. He went on to earn a master’s in mechanical engineering with a focus on composite materials. As part of his graduate studies, he came to ORNL to run experiments, working in the Polymer Matrix Composites Group. He graduated with his master’s degree in the fall of 2001 and returned to ORNL in the winter of 2002, running simulations and mechanical tests for various composites projects before being hired as full-time staff. After gaining additional experience at ORNL, Kunc decided to get his PhD. “Everyone in my family except one person has a PhD,” he said. “My mother is a chemist and my father is a computer scientist. Earning a PhD seemed like a requirement for me. It just made sense.” Kunc enrolled in Virginia Tech’s Engineering Science and Mechanics program. “It was difficult working full time while simultaneously earning my degree but being around so many influential and motivational people at ORNL really helped me excel,” he added. “I’m fortunate to be able to work at ORNL because of the variety of projects that come across my desk. ORNL is a unique place and I learn new things every day through interactions with colleagues and industry partners,” Kunc said. Kunc still enjoys sailing just as he did when he was a boy, when he can find time away from the lab.